The Los Angeles Times, commonly referred to as the Times or LA Times, is a paid daily newspaper published in Los Angeles, California, since 1881. It was the largest metropolitan newspaper in circulation in the United States in 2008 and the fourth most widely distributed newspaper in the country. In 2000, the Tribune Company, parent company of the Chicago Tribune and local television station KTLA, purchased the Los Angeles Times when Tribune acquired its parent company, the Times Mirror Corporation. The Times is currently owned by Tribune Publishing. 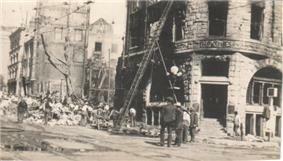 The efforts of the Times to fight local unions led to the October 1, 1910, bombing of its headquarters, killing twenty-one people. 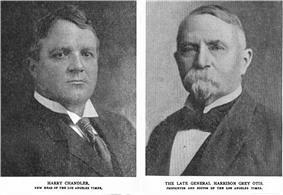 Two union leaders, James and Joseph McNamara, were charged. The American Federation of Labor hired noted trial attorney Clarence Darrow to represent the brothers, who eventually pleaded guilty. The fourth generation of family publishers, Northeastern United States due to its geographic and cultural distance. He sought to remake the paper in the model of the nation's most respected newspapers, notably The New York Times and Washington Post. Believing that the newsroom was "the heartbeat of the business", Otis Chandler increased the size and pay of the reporting staff and expanded its national and international reporting. In 1962, the paper joined with the Washington Post to form the Los Angeles Times-Washington Post News Service to syndicate articles from both papers for other news organizations. For two days in 2005, the Times experimented with Wikitorial, the first Wiki by a major news organization to allow readers to combine forces to produce their own editorial pieces. However, they shut it down after a few people besieged it with inappropriate material. The single copy rate is $2. Since March 2015 the paper increased its daily price $0.50 (33.3%) to match its Sunday/Thanksgiving Day rate (at newsracks tax included; price is higher in designated state areas). The paper's content and design style was overhauled several times in attempts to increase circulation. In 2000, a major change re-organized the news sections (related news was put closer together) and changed the "Local" section to the "California" section with more extensive coverage. Another major change in 2005 saw the Sunday "Opinion" section retitled the Sunday "Current" section, with a radical change in its presentation and featured columnists. There were regular cross-promotions with Tribune-owned television station KTLA to bring evening-news viewers into the Times fold. 2004 Pulitzer Prize-winner  (the beat that earned her Pulitzer). She speculated that the paper's revenue shortfall could be reversed by expanding coverage of economic justice topics, which she believed were increasingly relevant to Southern California; she cited the paper's attempted hiring of a "celebrity justice reporter" as an example of the wrong approach. 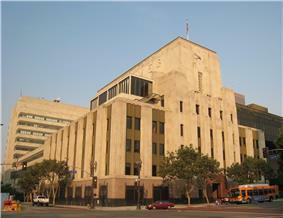 In December 2006, a team of Times reporters delivered management with a critique of the paper's online news efforts known as the  was followed by a shakeup in management of the paper's website, www.latimes.com, and a rebuke of print staffers who had assertedly "treated change as a threat." On March 22, 2007, editorial page editor Andrés Martinez resigned following an alleged scandal centering around his girlfriend's professional relationship with a Hollywood producer who had been asked to guest edit a section in the newspaper. In an open letter written upon leaving the paper, Martinez criticized the publication for allowing the Chinese Wall between the news and editorial departments to be weakened, accusing news staffers of lobbying the opinion desk. Times journalist  In 2004, the paper won five prizes, which is the third-most by any paper in one year (behind The New York Times in 2002 (7) and The Washington Post in 2008 (6)). Among the Times‍ '​ staff are columnists Steve Lopez and Patt Morrison and film critic Kenneth Turan. Sports columnists include Bill Plaschke, who is also a panelist on ESPN's Around the Horn, and Helene Elliott, the first female sportswriter to be inducted into the Hockey Hall of Fame. Former sports editor Bill Dwyre is also a columnist. 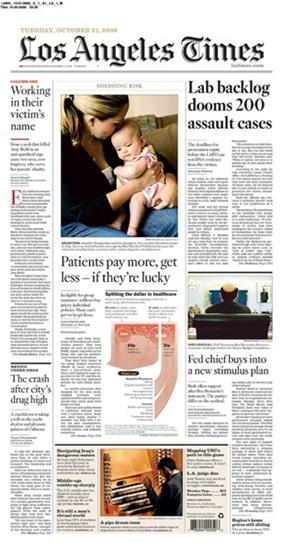 One of the Times‍ '​ features is "Column One," a feature that appears daily on the front page to the left-hand side. Established in September 1968, it is a place for the weird and the interesting; in the How Far Can a Piano Fly? (a compilation of Column One stories) introduction, Patt Morrison writes that the column's purpose is to elicit a "Gee, that's interesting, I didn't know that" type of reaction. On January 31, 2013 a KCBS-TV news report looking at the use of disabled parking placards in Los Angeles, featured Times health columnist Karen Voight using a disabled parking badge, thereby avoiding meter parking charges outside the fitness centre where she was teaching a class. The crew filmed Voight participating in the exercise class, and subsequently walking down the street without any problem. When the CBS reporter David Goldstein confronted the international fitness expert, she said "My knee is unable to do a lot of things." The Times-Mirror Company was a founding owner of television station KTTV in Los Angeles, which opened in January 1949. It became that station's sole owner in 1951, after re-acquiring the minority shares it had sold to CBS in 1948. Times-Mirror also purchased a former motion picture studio in Hollywood in 1950, which was then used to consolidate KTTV's operations. Later to be known as Metromedia Square, the studio was sold along with KTTV to Metromedia in 1963. ^ a b Somaiya, Ravi (September 8, 2015). "Austin Beutner Ousted as Los Angeles Times Publisher". New York Times. ^ a b "Tribune called on to sell L.A. Times". ^ October 23, 1923, page II-1Los Angeles Times,"Mirror Acorn, 'Times' Oak," Access to this link requires the use of a library card. ^ James L. Baughman (April 20, 2011). "The Fall and Rise of Partisan Journalism". ethics.journalism.wisc.edu. Retrieved October 27, 2013. ^ James Rainey and Michael A. Hiltzik (December 9, 2008). "Owner of L.A. Times files for bankruptcy". Los Angeles Times. ^ "Tribune goes to Zell". ^ Politi, Daniel (July 3, 2008). """Today's Papers: "You Have Been Liberated. Slate.com. ^ Bill Cromwell (April 26, 2010). "Like Newspaper Revenue, the Decline in Circ Shows Signs of Slowing". editorandpublisher.com. Retrieved April 26, 2010. ^ E&P Staff (May 25, 2007). "'"California Split: 57 More Job Cuts at 'L.A. Times. Editor & Publisher (Nielsen Business Media, Inc.). Retrieved May 28, 2007. ^ a b E&P Staff (May 28, 2007). "Pulitzer Winner Explains Why She Took 'L.A. Times' Buyout". Editor & Publisher (Nielsen Business Media, Inc.). Retrieved May 28, 2007. ^ a b Cleeland, Nancy (May 28, 2007). "L.A. Times"Why I'm Leaving The . Huffington Post. ^ Lieberman, David (May 9, 2006). "Newspaper sales dip, but websites gain". ^ a b Saar, Mayrav (January 26, 2007). "LAT's Scathing Internal Memo. Read It Here.". FishbowlLA (mediabistro.com). ^ Welch, Matt (January 24, 2007). "Spring Street Project unveiled!". ^ "Metromix Makes Cool Debut". ^ Ives, Nate (February 13, 2008). 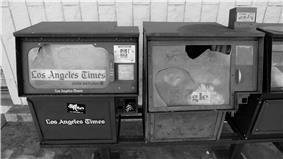 "Los Angeles Times Launches Free Weekly". ^ "Editor announces weekly tabloid aimed at social-networking readers". ^ Astor, Dave (January 5, 2005). L.A. Times' Drops Daily 'Garfield' as the Comic Is Blasted and Praised"'". Editor & Publisher (Nielsen Business Media, Inc.). Archived from the original on January 7, 2005. Retrieved March 26, 2007. ^ Stewart, Jill (October 14, 2003). "How the Los Angeles Times Really Decided to Publish its Accounts of Women Who Said They Were Groped" (PDF). jillstewart.net. Archived from the original on October 14, 2003. ^ "ASNE recognizes Los Angeles Times editor for leadership". ASNE.org (American Society of Newspaper Editors). March 24, 2004. ^ December 18, 1886, page 4Los Angeles Times,"Our Annual Trade Number," Access to this link requires the use of a library card. ^ December 21, 1888, page 4Los Angeles Times,"Our Annual Edition," Access to this link requires the use of a library card. ^ January 1, 1895Los Angeles Times,"General Contents," Access to this link requires the use of a library card. ^ , January 28, 1923, page II-12Los Angeles TimesQuoted in "Highest Praise Given to 'Times,'" Access to this link requires the use of a library card. ^ December 13, 1947Los Angeles Times,Display advertisement, Access to this link requires the use of a library card. ^ September 5, 1891, page 6Los Angeles Times,"'The Land and Its Fruits' — Our Harvest Number," Access to this link requires the use of a library card. ^ September 4, 1891, page 4Los Angeles Times,"Ready Tomorrow," Access to this link requires the use of a library card. ^ website"Los Angeles Times". latimes.com. April 17, 2014. Retrieved October 6, 2014. ^ rebecca Buddingh · Daily Trojan (September 26, 2010). 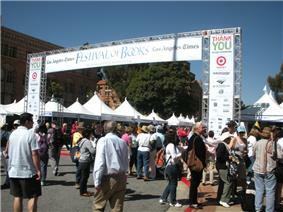 "L.A. Times fair comes to USC | Daily Trojan". Dailytrojan.com. Retrieved October 21, 2012. ^ Storch, Charles (June 27, 1986). "Times Mirror Selling Dallas Times Herald". ^ "Times Mirror set to sell four TV'." Broadcasting and Cable, March 22, 1993, pg. 7. Berges, Marshall (1984). The life and Times of Los Angeles: A newspaper, a family, and a city. Gottlieb, Robert; Wolt, Irene (1977). Thinking big : the story of the Los Angeles times, its publishers, and their influence on Southern California. 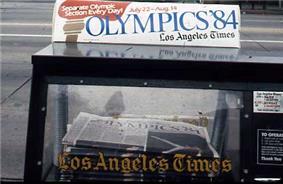 Los Angeles Times Media Group"The Times' 128-Year History,"